I first went to Acadia with my family for a summer break and loved the area. I’ve only been back a couple of times in the last 3 or 4 years but want to spend more time in this area of Maine. This is a large format book that seems to be difficult find now. This is a real shame because this book really does capture for me the essence of the National Park. Well worth getting a hold of even if it is through your local library. Yosemite is on my list of dream places to visit. I feel that I know the park through the work of Ansel Adams, William Neill and Michael Frye to name just a few. However this book presents a very different Yosemite one that fewer people are likely to be familiar with. The book represents a collaboration between photographers Charles Cramer, Karl Kroeber, Scot Miller, Mike Osbourne, Keith S. Walklet, Mike Osborne and focuses, as the title suggests, on the regions of Yosemite that you have to hike and camp to get to – Yosemite’s Wilderness. Having been recently prompted to take another look at Joe Cornish’s photography I was pleased to find this book. Here Joe provides insight into the way that he approaches photography. Each of the seven chapters is introduced with a short essay that highlights a key aspect of his approach followed by the stories behind a number of photographs that drive the point home. While not a ‘how to’ book in the traditional sense, although the technical information for each image is provided, there’s lots of practical advice here. More often than not I find that my eye is drawn to details rather than the grand view. At the beach this can mean shells, rocks or patterns in the sand. 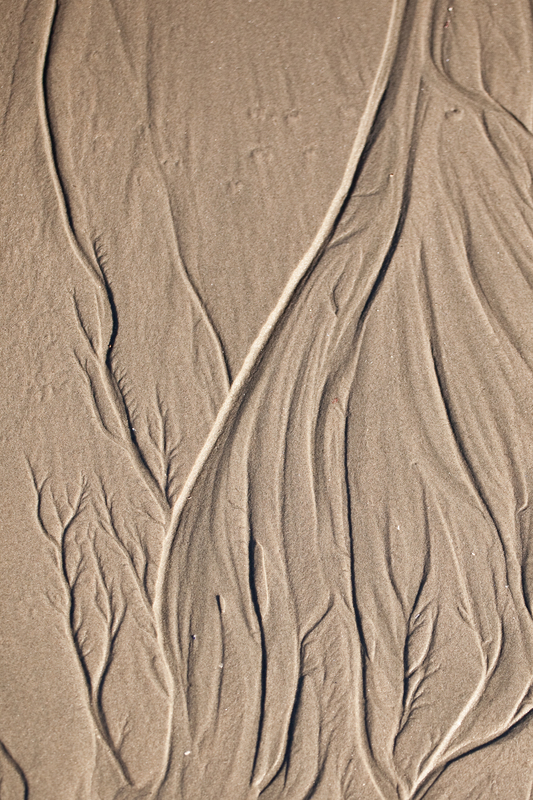 One of the beaches that I visit often seems to be a mixture of sand and clay that is easily sculpted into interesting patterns by the water running back into the ocean. Here I found a patch of sand that I thought looked like flames. This entry was posted in Uncategorized by nixonphoto. Bookmark the permalink.